Please welcome the fabulous Megan Auman – jeweller, business strategist, artist, designer, brilliant entrepreneur, and my lovely friend. Megan is going to be stopping by every other month to answer three of your burning questions – think of her a little like a whip-smart, no-nonsense business advice columnist. I am starting my craft business online but want to know how to create a terms and conditions page. Details like what I need to cover to make sure both parties are safe would help. In the last 6 months I have started my own small business and am in the process of developing a product to sell online and in retail. My question is how to I protect my product from copy-cats? Any top-tips? 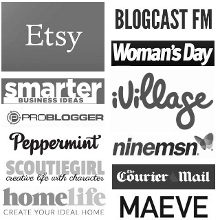 I know myself it’s very, very easy to get loads of great ideas from Pintrest and Etsy and other websites – and there will always be people who will be able to copy my product at home. But how do I put them off being able to copy mine? There are a few ways to keeping copycats at bay. One is to avoid overly simple or basic processes and forms. I had a jewelry teacher once tell me that any piece that you put into production should take at least five steps to make, because it’s unlikely that most people will be dedicated enough to copy that many steps. Ultimately, the best defense against copycats is building a strong and recognizable brand. If you build a clear and consistent brand image, it will be more likely that other people will notice if someone copies you and will recognize the copy cat as a knock-off. The best brands are those that focus their energy on constantly designing, creating, and innovating. You won’t be able to stop everyone from copying you, but you’ll be such an original that in the end it won’t really matter. How often should you check in with your wholesale shops to see if they need a re-order? There actually isn’t a straightforward answer here, because not every shop turns merchandise over at the same pace. Within my wholesale accounts, I have stores that order every few weeks and stores that may only order once or twice a year. Ultimately, you want to get to know which shops sell the quickest, because those are the shops you’ll want to touch base with every few weeks. A good rule of thumb is to follow up a few weeks after you’ve sent the order to make sure everything and then check in once a quarter to see if they need to reorder. At the minimum, you should reach out to your stores every six months, usually to coincide with the major trade show buying seasons. But it never helps to reach out more, especially a month or so out from major shopping holidays (like Valentine’s Day or Mothers Day) and two months out before the Christmas season. Got a question for Megan Auman? Leave it in the comments below or email it to megan@createandthrive.com (that’s direct to Megan Eckman, Assistant Editor).